Arguably the favorites to win this year, the inaugural season of WWE’s NXT produced a heel stable by the name of The Nexus. Including such members as Daniel Bryan and Wade Barrett, the group was a dominant force in WWE for several months. 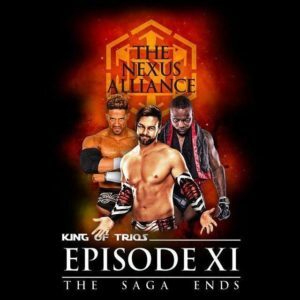 At King of Trios 2018, former members PJ Black (Justin Gabriel), Michael Tarver, and Fred Rosser (Darren Young) will vie for the prize of Trios champs. While Young competed the longest in WWE at fifteen years, Black maybe considered the more dominant force having become a significant entity on the independent circuit following his time at WWE. A member of Lucha Underground‘s Worldwide Underground, Black earned gold alongside former WWE champion John Morrison (Johnny Mundo) and former AAA champion Jack Evans winning that promotion’s trios title (as a team from Lucha Underground won the KOT title three years ago). An innovative high flyer with over two decades of experience, Black could very well lead his team of fellow former WWE competitors to the finals and beyond. A group that could very well prove to be a dark horse for the tournament is the Ohnaka Gang. Featuring Impact wrestling knockout Katarina (Katie Lea Burchill in WWE) and CMLL former champion Rey Bucanero, the trio include among its members Pierre Carl Ouellet. Best known to casual fans as a member of WWE’s Quebecers, Ouellet has underwent a career resurgence of late as PCO. Something of a superhuman freak of nature, PCO defeated one of the most dominant wrestlers on the indie scene today in WALTER (who’s rumored to be WWE bound shortly) at Joey Janela’s Spring Break 2 in New Orleans. Since then, he has become one of the hottest commodities in the indies competing across the country (including being announced for BOLA in mid-September). A career that has spanned over three decades and who maybe more popular now than ever, the spectacle of seeing PCO live would be more than worth the price of admission. While the women’s revolution has become a massive boon for WWE in recent years, many of its stars were largely made in the independent promotion Shimmer. 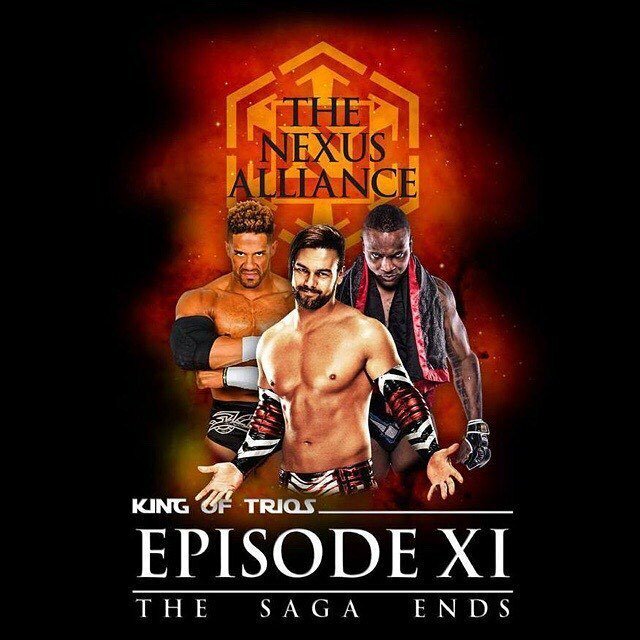 One of the premier women’s wrestling promotions in the United States, this year is only the second time the promotion is sending a team to compete in King of Trios (the first team saw 2/3 of its members signed by WWE). The trio of Australian wrestlers will include Shazza McKenzie and Jessica Troy lead by Madison Eagles. At only 34 years of age, Eagles is considered one of the best female wrestlers on the planet who beat out WWE, Impact, and Japanese performers to become the top rated female wrestler for Pro Wrestling Illustrated‘s PWI Female 50 in 2011. 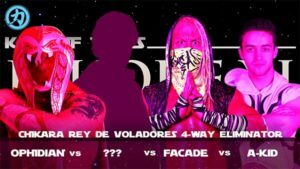 Having spent half of her life competing as a professional wrestler, Eagles and her team have to be considered frontrunners for winning this year’s trios tournament. As NXT has transitioned from WWE’s developmental territory to a third brand for the company, to a degree the promotion Evolve has become something of the premier wrestling company’s developmental. One of the biggest stars of Evolve who has yet to sign with WWE is Chris Dickinson. One half of the promotion’s championship tag team Doom Patrol, Dickinson competed alongside his partner Jaka at WrestleMania Axxess 2018 putting their Evolve titles on the line against the NXT tag team of Danny Burch and Oney Lorcan. 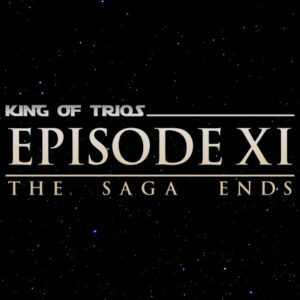 At King of Trios, Dickinson will be joined by 2018 Chikara Young Lions Cup Winner Cam Zagami (who also competed on John Cena’s American Grit) and Ring of Honor 2017 Top Prospect Tournament competitor Brian Milonas (who currently teams in ROH with the Beer City Bruiser as the Bouncers). 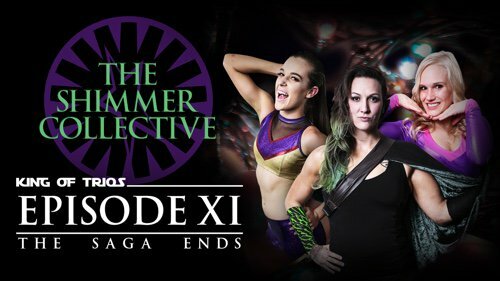 Noted earlier, Shimmer has sent a team to compete in the King of Trios tournament for only a second time as the first team mostly went to WWE later. In that inaugural team, Madison Eagles was signed to lead that trio but dropped out due to injury. In her stead came young star Solo Darling who went on to become a major breakout star in Chikara. Darling returns for her third consecutive King of Trios joined by Shine’s Aja Perera and former WWE Women’s Champion Molly Holly. Undoubtedly considered for WWE’s Hall of Fame, Molly Holly has competed in the last year for WWE as part of the women’s Royal Rumble match as well as appeared twice on the WWE Network series Table for 3. This coming October, WWE will put on an all women’s wrestling event called Evolution featuring over 50 women which could very well include Holly. Regardless, Holly hasn’t largely competed for an independent promotion in over a decade so seeing her perform at King of Trios maybe a once in a lifetime opportunity to see the legend in action and in a venue where it won’t be from the nosebleed section of a major arena. While the women’s revolution maybe a recent development for WWE, Chikara has prominently featured all women teams in King of Trios for over half a decade. Further, they bring some of the best Japanese female wrestlers to the United States for its premier tournament (noted earlier, last year featured Meiko Satomura who competed in three KOT events). As WWE (as well as Ring of Honor) continues to bring female Japanese stars into its brand, Chikara signed a team from Tokyo Joshi Pro (sister brand of DDT Pro) that will include current Princess of Princess Champion Miyu Yamashita and the tag team of Yuka Sakazaki and Shoko Nakajima. Graduates of the DDT Dojo, these young stars represent some of the country’s latest best and brightest rising up to fill the void left by many of their field’s giants signed in America. Mentioned prior, Chikara has scoured the globe finding competitors from South Africa, Canada, Mexico, Australia, and Japan for this year’s tournament and just as the promotion was something of an early indicator of the presence the United Kingdom would have in the industry, Chikara is bringing in a second team from the booming wrestling scene in Australia. 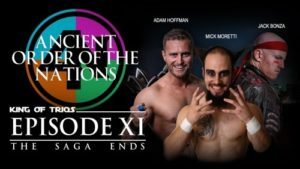 Hailing from Newcastle Pro Wrestling, Mick Moretti, Jack Bonza, and Adam Hoffman will be the second team in this year’s King of Trios representing the land down under. Part of the heel stable Four Nations, the group has recently made a splash competing in PROGRESS Wrestling where they defeated the current NXT Tag Team Champions British Strong Style only a few months ago. In all likelihood, their appearance could be the group’s first prominent step into the United States before making it big giving attendees a seat on the ground floor of this debut. Few groups in Chikara have the staying power of F.I.S.T. Founded by Icarus and Gran Akuma, F.I.S.T. became one of the most prominent heel factions in the promotion. 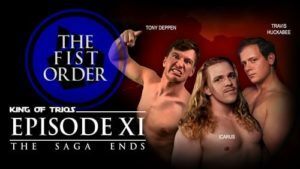 A springboard for such performers as WWE’s Johnny Gargano and New Japan/Ring of Honor’s Chuck Taylor, Icarus returns to lead two new members in Travis Huckabee and Tony Deppen. A recent guest on our site’s podcast and sister podcast Wrestling Time Machine, Huckabee is a rising star for the promotion having won the second Johnny Kidd Invitational (including defeating the tournament’s inaugural winner) and defeated Gran Akuma in his retirement match. Only competing for less than two years, Huckabee undoubtedly has a bright future in the company if not the industry and King of Trios can be a prominent showcase for his abilities. 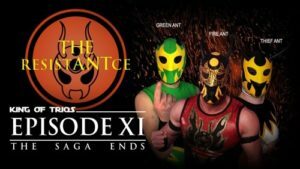 Arguably the most consistent and dominant babyface faction in Chikara, the Colony has seen many changes over the years as its members have transitioned elsewhere while its leader and founder Fire Ant remains to lead the charge. However, given today’s wrestling environment, he too could very well move on to other things which makes his every match remaining on the independent scene special. 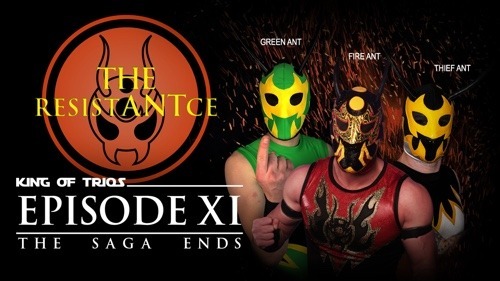 Much like how Icarus is leading the next generation of evil in F.I.S.T., Fire Ant is leading the next generation of good in the modern day Colony featuring recent additions Green Ant and Thief Ant. Given the story based nature of Chikara and the prominence of King of Trios, the coming event could have quite a bit of significance for the future of the group. While the Colony has reinvented itself a few times, a new babyface faction has grown to rival the group in Xyberhawx2000. 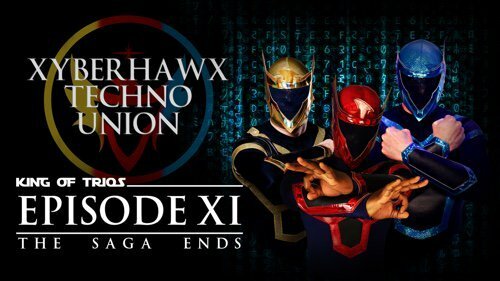 Members of an alien peacekeeping organization, Razerhawk, Nytehawk, and Danjerhawk have been sent to Earth to quell a rising dark force detected from their home galaxy many several light years away. Since coming to Chikara, the group has made an impact as individuals with Razerhawk winning the Young Lions Cup and Danjerhawk being the current Young Lions Cup Champion. Time will tell if they can come together as a unit to collect shared gold. 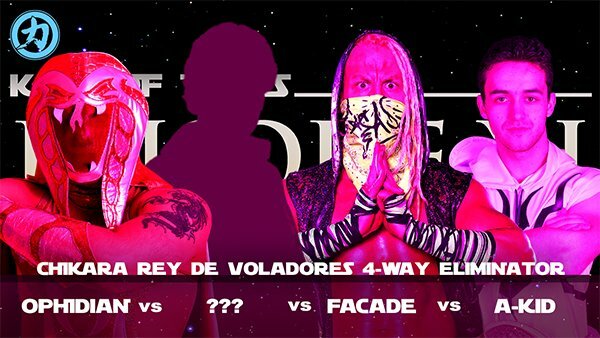 I would be remiss if I did not mention the Rey de Voladores (“King of Flyers”), a series of elimination matches taking place over the final two nights of King of Trios which has drawn the likes of the Young Bucks, Kota Ibushi, Sami Zayn, Neville, Ricochet, and Austin Aries in the past. This year’s series will feature Facade, Ophidian, A-Kid, Carlos Romo, and Cam Carter (leaving the final three unnamed, likely to be drawn from eliminated participants from the first night of KOT). There remain some tickets still available for all three nights and Easton is only 90 minutes away from Philadelphia. This entry was posted in Professional Wrestling and tagged Beyond Wrestling, Chikara, Jerry Whitworth, King of Trios, Nexus, NXT, PCO, Shimmer, Tokyo Joshi Pro. Bookmark the permalink.